The Fergus Boardroom is aptly named after Scottish immigrant James Fergus, who was a man of great vision and ambition. The Fergus Boardroom provides the ultimate environment for meeting. 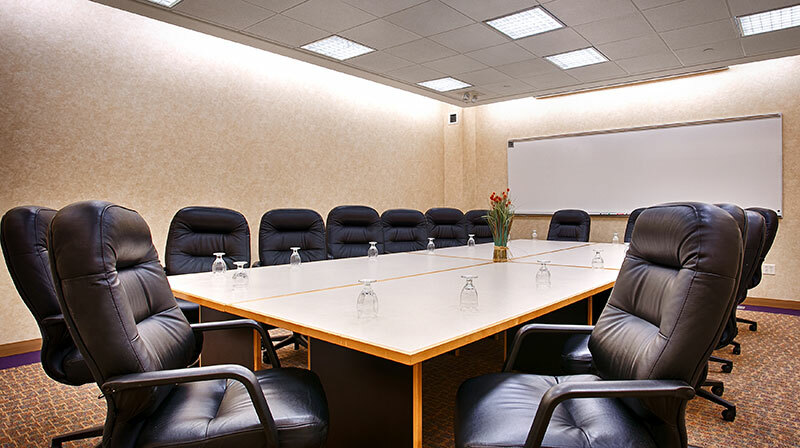 It features an expansive conference table with executive-style leather chairs that comfortably seats 16 in the traditional boardroom configuration. It comes fully appointed with teleconferencing capability, LCD projection screen and a full-wall whiteboard. The Whitford Room originates from one of James Fergus’ employees, Joseph Whitford, who christened the town of Fergus Falls in honor of his employer. This convenient breakout room can be used to accommodate groups under 100 or can be combined with the neighboring Page Room to provide a much larger meeting space. As is standard in all of our meeting spaces, this room is complete with wireless internet, built-in projection screen and overhead sound system. The Page Room derives its name from one of the original builders of Fergus Falls, Henry G. Page. 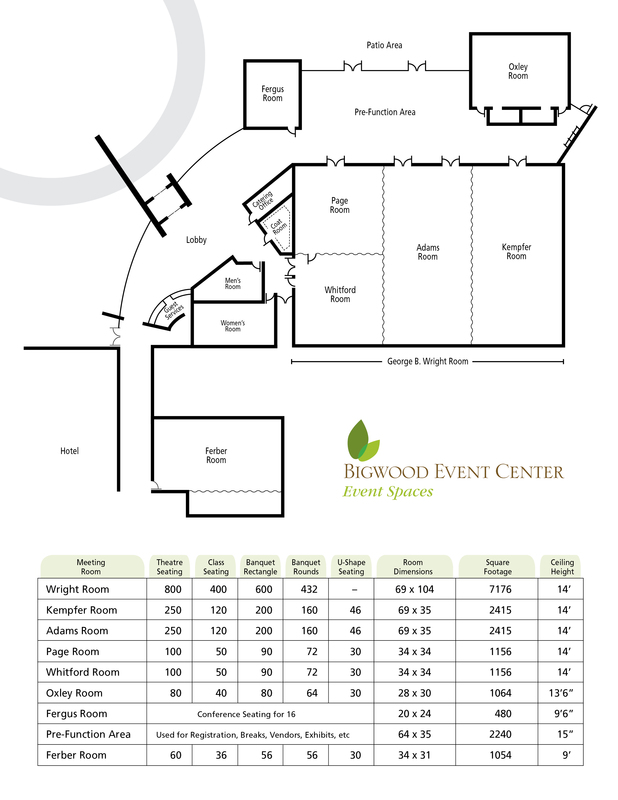 This convenient breakout room can be used to accommodate groups under 100 or can be combined with the neighboring Whitford Room to provide a much larger meeting space. Often used as a convenient lunch room or quick meeting space, this room is conveniently located directly off of the Pre-Function Area. The Adams Room gets its title from Elmer E. Adams. The Adams name is one of the most prominent in the history of Fergus Falls. 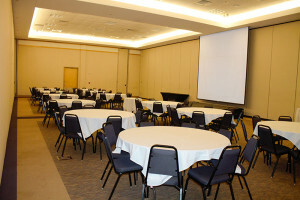 This large meeting room can be used to accommodate groups under 250 or can be combined with neighboring meeting spaces to provide a partial ballroom. Often used for large meetings or conferences, the Adams Room is the perfect location to hold your next gathering. The Kempfer Room has an interesting namesake. Hannah Kempfer, the illegitimate child of a ship’s stewardess and captain, was the first rural woman legislator in Minnesota. 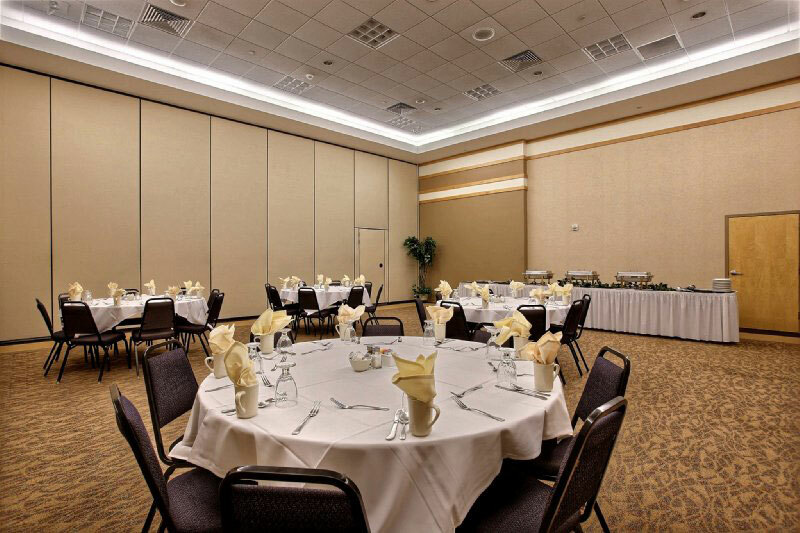 Widely respected for her honesty and diligence, she was affectionately known as the “Lady from Otter Tail.” This large meeting room can be used to accommodate groups under 250 or can be combined with the neighboring Adams Room to provide a partial ballroom. 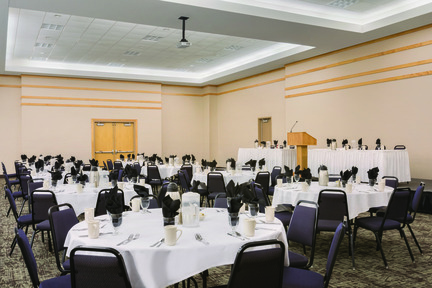 Often used for large assemblies or conventions, the Kempfer Room is a fantastic spot to hold your general session and features a ceiling-mounted LCD Projector. Anyone who has seen photographs of the aftermath of the great Fergus Falls Cyclone of 1919 knows the work of W. T. Oxley. 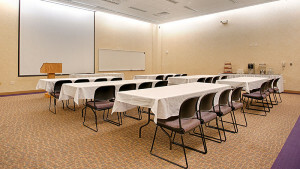 The Oxley Room is a private meeting space that can comfortably fit groups of 80 or less. This room is popular with our corporate clients and features the same built-in LCD projection screen and overhead sound system as our other meeting rooms. 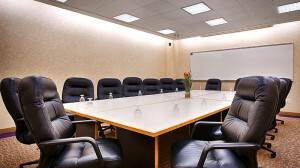 If the Fergus Boardroom is just a little small for you, consider Oxley for your next business meeting. You won’t regret it! 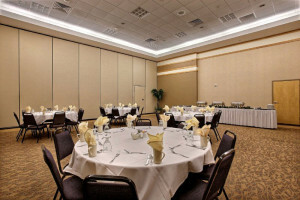 Our Pre-Function Area offers tremendous space for guests to gather. With over 2200 square feet and exquisite 15’ ceilings, we are able to fulfill various set-ups and details to suit your needs. 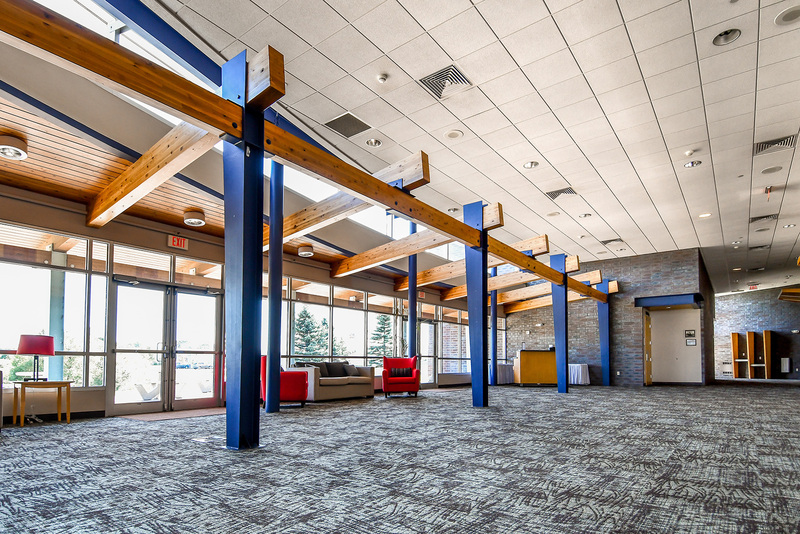 This inspired and spacious Pre-Function Area is perfect for attendee registration or displaying vendor exhibits. It also features floor to ceiling windows and is sure to impress your guests the minute they arrive. This fantastic meeting room is named after the late Mayor Kelly Ferber for his dedication to our community and facility. Previously known as Stewart Hall, this space is located in the hotel portion of our property. 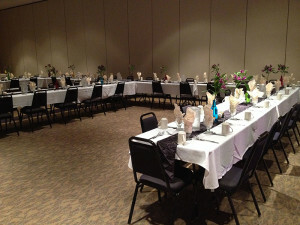 Perfect for groups of up to 60 people and it can be customized to your needs. A 55” LCD TV takes the place of a projector and screen and is often preferred by our smaller groups. There is no need to bring anything other than your laptop for this room. Often used for small meetings or corporate socials, the Ferber Room is attached to our on-site Z103 Bar & Grill. Need a place for the group to gather after a long day of meetings? Ferber is the place for you.